In the geodetic map of the world, 0 Aries is at 0 longitude (Greenwich), and the rest of the signs follow eastward in their natural order at every 30 degrees. So, 0 Taurus is at 30 degrees east, 0 Gemini at 60 degrees east, and so on. My observations show that once a planet enters a sign it begins to activate the entire area of the sign. This is especially true with Saturn and the outer planets. The ongoing powerful cardinal T-square between Jupiter-Uranus in Aries, Pluto in Capricorn, and Saturn in Libra, from the Bering Sea to Western Europe, explains the latest destructive weather patterns, catastrophes, and other world conflicts. The intensification of this powerful planetary configuration also produces a reaction point in Cancer affecting China, Thailand, and Indonesia. China experienced devastating floods, and Thailand was in turmoil with violent political riots. 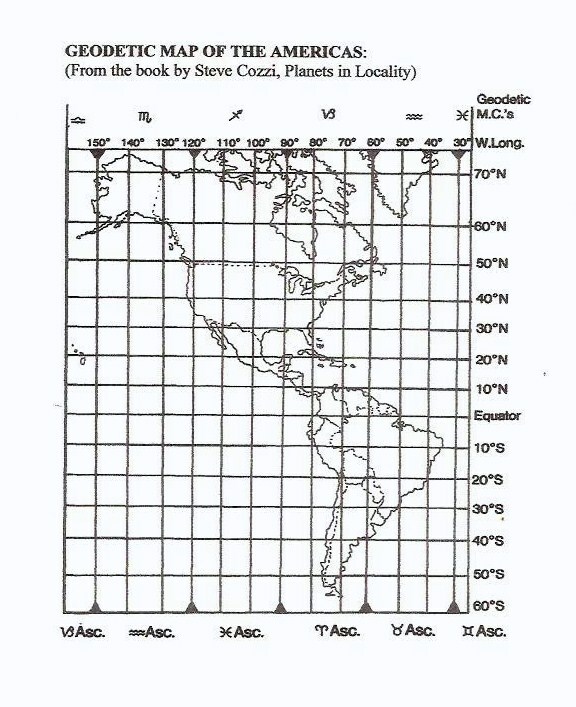 Pluto in Capricorn activating the area around 90W longitude between the Pacific and the Atlantic Oceans explains the terrible problems affecting the Gulf of Mexico, Central America, the earthquakes in Haiti (January 2010), and Chile (February 2010). Uranus geodetically above Iceland caused a massive volcanic eruption (March 2010) disrupting air travel that extended as far as Aries area extends into Western Europe. Pluto is the main force driving the global cardinal T-square and thus linked to the oil well explosion in the Gulf (April 2010) and the ensuing and continuing tragedy. Pluto began to affect the Gulf when it reached the middle degrees of Sagittarius, which mark the geodetic start of the Gulf. Pluto was there in 2005 during hurricanes Rita and Katrina. Pluto also activated the last major California earthquake in 1994, in the last degrees of Scorpio, crossing 120W longitude. The Iceland volcano was last active during the 1820-22 Uranus-Neptune conjunction at 0-3 degrees Capricorn, square Jupiter-Pluto at 0-3 Aries. The same cardinal signs and degrees are being activated again by the ongoing cardinal T-square. In addition, transiting Saturn is conjunct the Iceland ascendant-Neptune, square transiting Pluto, and in 2011-12 Pluto begins to oppose Iceland’s progressed Saturn. The previous eruption is believed to have lasted for an entire year. This one might last as long as these dynamic planetary configurations continue to activate the area. In addition, when eclipses or transiting Mars trigger the sensitive points, problems are expected to intensify, as could happen through September 2010. Also evidence of geodetic effects is the melting of Greenland’s glaciers, influenced by Uranus and Neptune. Aquarius, with Pisces, geodetically covers the entire territory of Greenland. When Neptune joined Uranus in Aquarius in 1998, the melting of Greenland’s glaciers increased significantly, and has continued while these two planets have been on mutual reception 2004-2011 (on each other’s signs). This situation might continue while Neptune is in Pisces 2011-25. We can also speculate on what Pluto will do when in 2024 it enters Aquarius and begins to activate the area, inclusive of the entire Atlantic Ocean. Pluto could either freeze the glaciers all over again, or melt them completely causing the oceans to rise to catastrophic levels. Meanwhile, the crucial cardinal T-square will continue to activate the entire world until 2011: more devastating events are thus to be expected. The powerful Uranus-Pluto square in Aries and Capricorn will remain in effect until 2016. This could mark the lasting effects of the tragic oil spill in the Gulf, among other things. The cycle between these two planets ranges between 115-140 years and is the one most closely associated with major earth changes in the evolutionary process. Thus, the anticipated earth changes in 2012 have already begun. Powerful Pluto is the most important planet to watch on its geodetic path. Astrologers know better than to underestimate its destructive power, which can lead to transformation. We also know how it defines generations and instigate the mass movements that shape society and change the world. Astrologers know the circumstances and timing, but the overall results are always dependent upon humanity’s level of awareness. (To make your own Geodetic Map, purchase a laminated World Map (8.5x11) in any office supply store. On the space above the longitudes, post the 12 symbols of the signs, every 30 degrees beginning with Aries at 0 longitude and continuing eastward).